This is a great mod, but I'd love to see it compatible with Ender IO's "soulbound" enchantment which lets you keep things at death. Right now, you can't use both, since the gravestone still takes everything. i'v used it for a long time now and it has been amazing. BTW the dark and dangerous areas in this mod are the cemeteries, or those i like to call, graveyards! 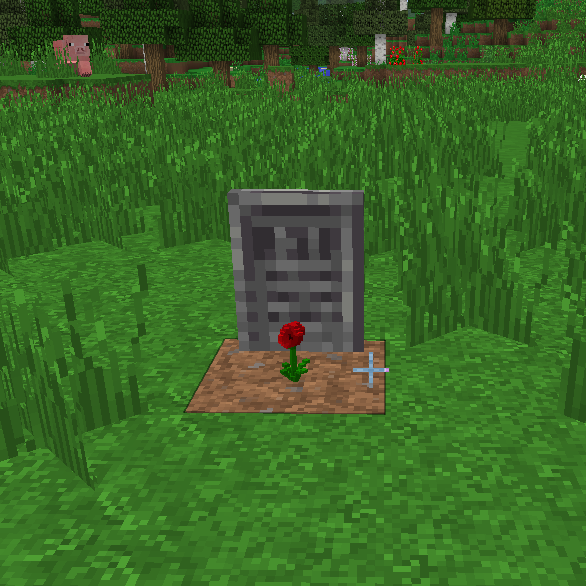 Could it be possible to change the way to make Grave to something like Chisel2? as in, right-click with your chisel, place a block and choose from a list. And maybe, be able to transform a Grave into another? I'm pretty sure you could ask for tips/API to help for both thing, from TheCricket26 and waskiebob. finally, simple question, are the skull and candle, and the candle alone, Thaumcraft Infusion stabilizer? and to about what level? In Thaumcraft's code, it only asks if it is a infusion stabilizer or not instead of a numerical value. Would you have any advice on how to find out where a grave of the player has been created? I died somewhere, and I just can't remember. I tried looking in the forge log, but the listed coordinates don't have graves on them. Does the grave despawn after a while? I would really much appericiate any help! By 1.7 does it mean 1.7.10? Or just 1.7. Thank you, I never know.